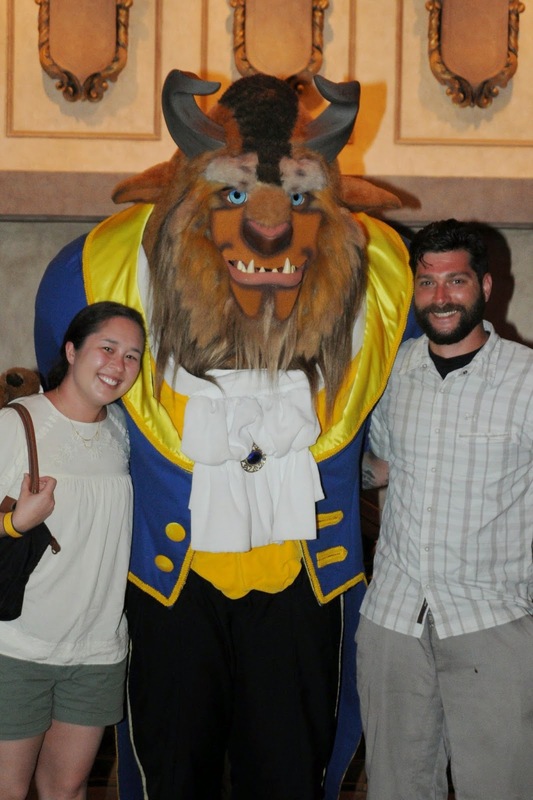 Six months before our trip to Disney, I made a dinner reservation for two at Disney's relatively new Be Our Guest Restaurant. As a huge Beauty & the Beast fan, this part of the new Fantasyland was one of the must-dos on my list for the trip. Best. Belle. Ever. Her brother was dressed as Gaston. The location is made to look like Beast's castle. You check in before the "drawbridge" and receive a buzzer to wait outside for the meal. It really does make you feel like you're walking in to Beast's castle! A host comes out to you, handing you a candelabra (like Lumiere!) to walk to your table. We were seated in the ballroom dining area, but I hear you can request the West Wing and sometimes the Rose Gallery. In hind sight, I should have spent more time walking through the West Wing after dinner! It was loud and busy, but not so loud you couldn't carry conversation. While it was kid-friendly and there were plenty of them around, it definitely felt like a nice place. 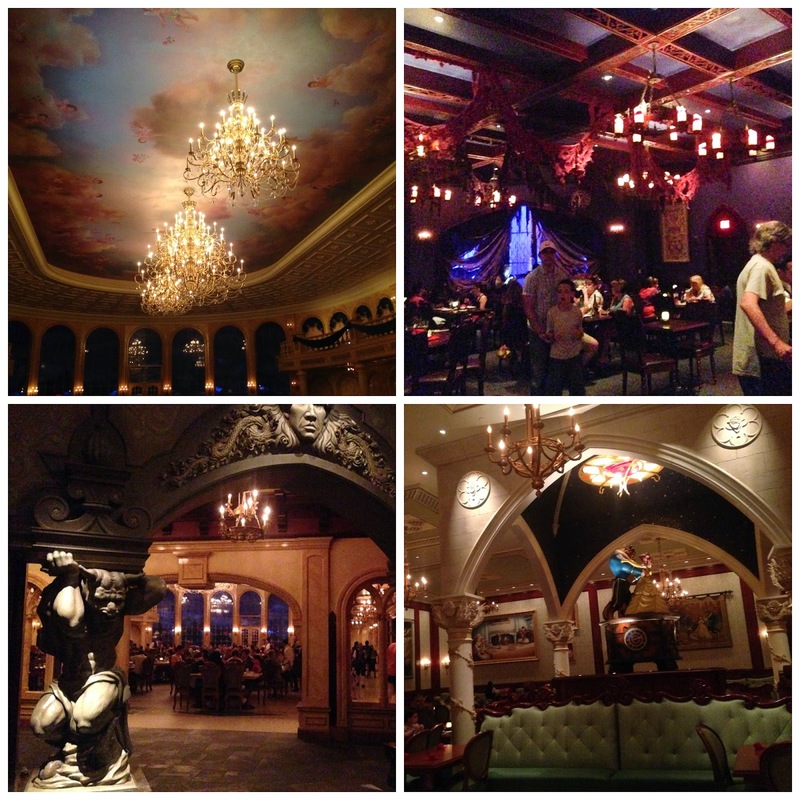 Dinner at Be Our Guest is also the ONLY TIME you can drink alcohol in the Magic Kingdom. For real. I guess Walt didn't want booze in the MK, but at our dinner Dan was able to get a Saison Dupont from Belgium, while I enjoyed a red wine from Nuits-Saints-Georges in Burgundy, a place I remember well for its wine. The only booze in the MK. Like a boss. Our meals came with some good bread and butter to start. Our entrees came very quickly. I had the Grilled Strip Steak with Garlic-Herb Butter and Pommes Frites, while Dan had the Herb-crusted Lamb Rack with a Stone-ground Mustard Demi-glace serve with Buttered Celery Root and Seasonal Vegetables. Dan loved his lamb, and my steak was delicious. But of course, we had to save room for dessert. Everyone told us to try the "Grey Stuff" as the movie's song suggests! They bring out a fancy dessert cart and plate up your choices tableside. Dan loved it, as it was kind of a chocolate cookie shell with grey frosting. He loves cookies and cream so it was definitely his style. I preferred the Strawberry Cream Cheese Cupcake, and promptly devoured most of it. We each shared dessert but had a clear favorite. It was one of the best cupcakes I have ever had. After dinner, we were allowed to walk through the other rooms to see them. I was a little buzzed from the wine, so I didn't linger as long as I might have. You can meet for photos with Beast in his study on your way out. I didn't get the greatest photo with him (I blinked in one, so below is the only other one I have), but at least we have something to remember the meal by. Overall, this was our favorite meal at Disney. I hear the walk-in lunch is a completely different experience, so that may skew some of the reviews, but I wouldn't hesitate to do the dinner again. Can I just say that when you said, "I should have spent more time walking through the West Wing after dinner" I really wanted to ask, "Why, what's in the West Wing?" ...and to "but at least we have something to remember the meal by." I ask you, was it a magic mirror? I'm so glad this was your favorite meal! That steak is AMAZING! Stinking LOVE those fries that come with it.